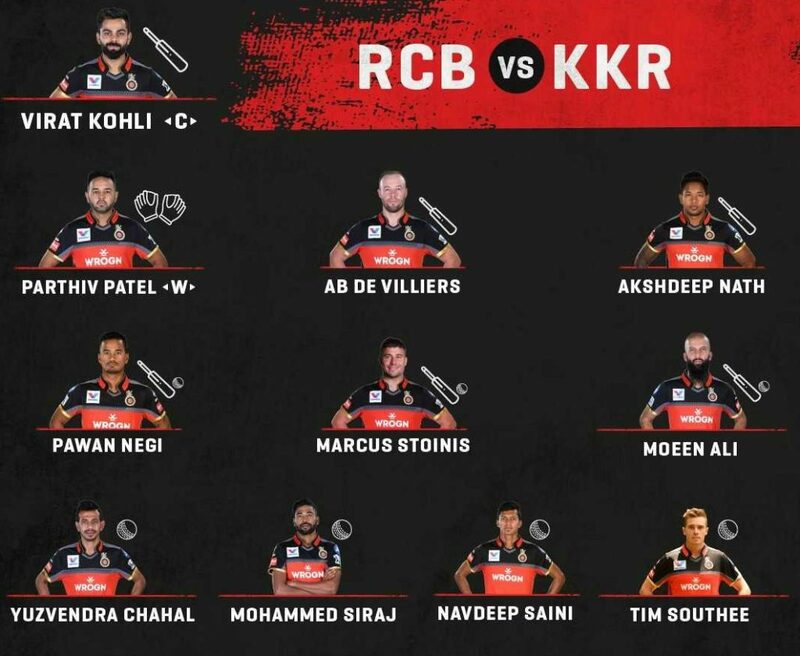 After being sent into bat by KKR, the RCB opening pair of Parthiv Patel and Virat Kohli gave their side a solid start at the Chinnaswamy. The duo added 64 runs for the first wicket before Nitish Rana had Parthiv LBW for 25. Rana could’ve also had Kohli caught in the very same over, but Narine put down a sitter at mid wicket, and that drop was to prove very costly for KKR. Kohli and AB de Villiers entertained the spectators with some fantastic hitting and put on 108 runs for the second wicket. The Indian skipper was finally dismissed for 84, with Kuldeep Yadav taking a fine return catch off his own bowling. In the process Kohli also become the leading run scorer in IPL history, surpassing Suresh Raina. Marcus Stoinis farmed the strike after Kohli left and that perhaps lead to a loss in momentum for De Villiers, who holed out to long off in the 19th over. Stoinis however made amends by taking Prasidh Krishna for 18 in the final over as Bangalore finished at 205/3 in their allotted 20 overs. Chasing a mammoth score of 206, the KKR pair of Narine and Chris Lynn got their team off to a flying start as they added 28 runs in 11 balls, before the former was dismissed by the pacy Navdeep Saini, with Negi taking a good catch on the fine leg boundary. Lynn and Robin Uthappa steadied the innings with a 65 run partnership for the second wicket, but spin brought RCB back into the game, accounting for Lynn, Uthappa as well as Rana. 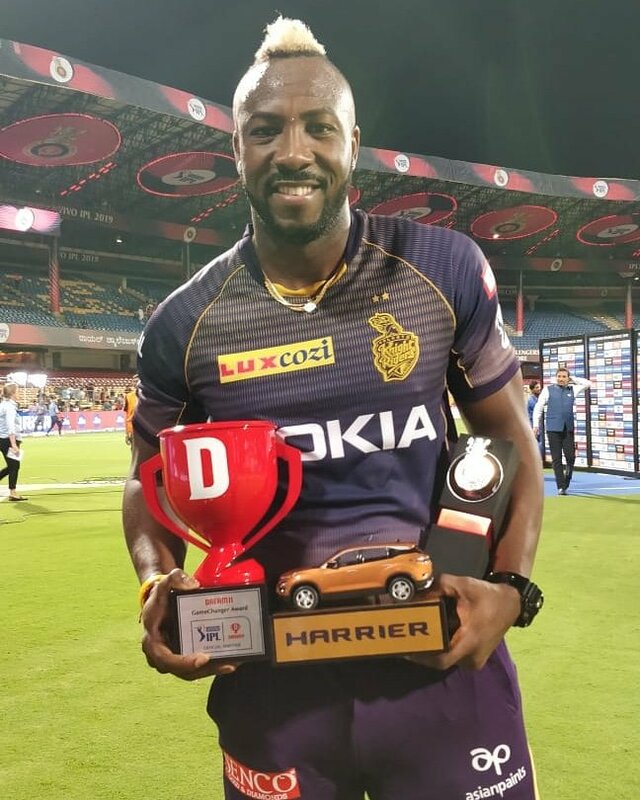 With the Kolkata Knight Riders needing over 50 in the final three overs, the Royal Challengers were firmly in control, but Mohammad Siraj bowled a beamer that took him out of the attack, and Russell launched into Stoinis, who was asked to finish the over. The penultimate one from Tim Southee, was even worse, with length balls and short ones all dispatched with glee by Russell. The Kiwi pacer conceded 29, and the home fans could only watch shocked as their side effectively snatched defeat from the jaws for victory. Young Shubman Gill scored the winning run as the home side reached the target with five balls to spare. With this win KKR climb to the second position in the points table, while RCB, as mentioned above, are yet to open their account. The 18th match of the Indian Premier League will be a double header with Chennai Super Kings taking on Kings XI Punjab at Chennai, and Sunrisers Hyderabad squaring off against the Mumbai Indians at Hyderabad on April 6.